Ranbir Kapoor and Katrina Kaif starrer 'Jagga Jasoos' is all set to release on July 14. Who would have thought that this Anurag Basu film would actually witness the days of marketing after two years of delay? Now it has gone past the post-production phase and is inching towards the end of promotions. One of the reasons, as speculations and rumours have it, behind the infamous delays of 'Jagga Jasoos' is Ranbir Kapoor and Katrina Kaif’s relationship and their breakup. But it seems that the co-stars share genuine bonhomie that goes beyond relationships. And nothing makes this more evident than the latest videos shared by Katrina Kaif on her Instagram handle. Katrina Kaif who is super active on social media shared two videos on her official Instagram accounts. In one of the videos, which she has captioned "Jagga , jughead and a true genius. (We❤you pritamda)", Ranbir, Katrina and Pritam (music director of 'Jagga Jasoos') are seen listening to the film’s music. Katrina is whole heartedly into the music forgetting the world and Ranbir hits her with a pillow. The three share some fun moments and then Ranbir goes all silent into his mode until interjected by Pritam. In another video, which is titled "JAGGA JASOOS- Lessons from the 1st day of shoot", Katrina introduces Ranbir as a multi-award winning actor and says that he is trying to teach everybody the finer nuances of acting. Upon which Ranbir replies wittily that we need to select people who can learn and few people don’t have the potential to learn. Katrina then smartly retorts, "This happens you know. When someone who has learnt from somebody, as in he has learnt from me, they feel very complexed by it and it’s okay you have to move on from all this." Then follows few behind the scenes clips. 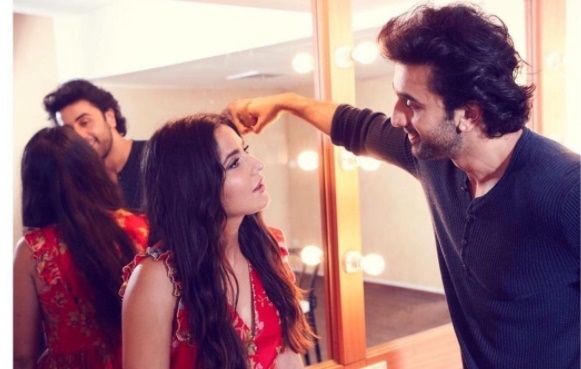 These two videos prove that Ranbir Kapoor and Katrina Kaif’s relationship goes beyond the usual expectations and perceptions and it’s all about the genuine feel attached to it which is friendship. 'Jaggao Jasoos' is about a teenage boy who is in search for his lost step-father played by Govinda. It is scheduled to release on July 14.